A nice hike today with long-time friend Lelia. 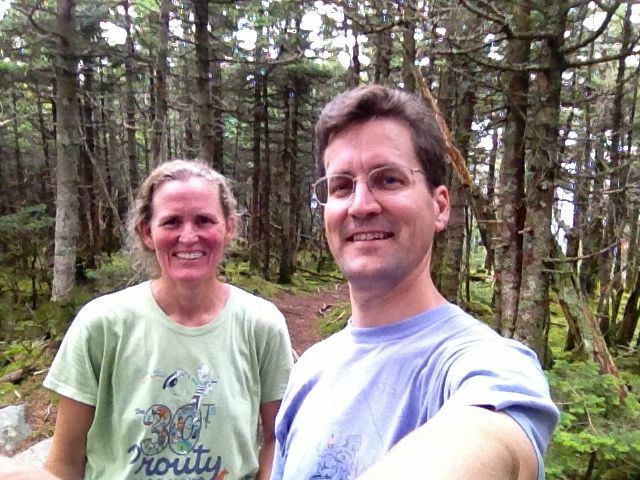 We zipped up Mount Ellen, on the Long Trail in Vermont, from the west via the Jerusalem Trail. It was a cloudy day, threatening rain, but we reached the treed summit in two hours and spent a pleasant hour sitting at the top of the Sugarbush chairlift enjoying the sun-speckled view to the east. We stopped at Ben & Jerry’s factory for some ice cream – of course! – in the sunshine before driving through a thunderstorm on the way home. Good timing! With this peak, I’ve finished my Vermont 4000′ collection, started in 1984 with Mount Mansfield. Thanks Lelia!